Time Period: 1960’s to 1990’s. 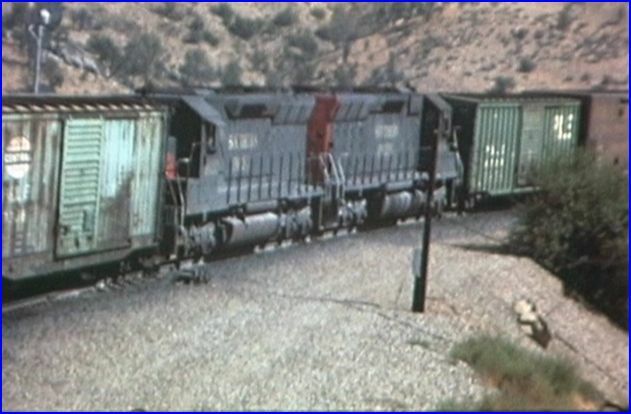 Locations: Caliente, Walong, Cajon Pass, Palmdale Cutoff, Barstow Yard, Taylor Yard, Bealville and much more..
Tehachapi Loop is one of the most famous railroad locations in the world. 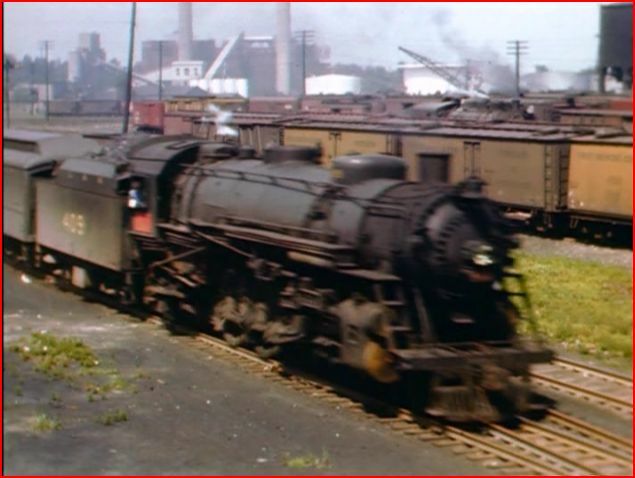 Rich in history, the area is a hotbed for; trains and railfan photographers. This show covers over 30 years. 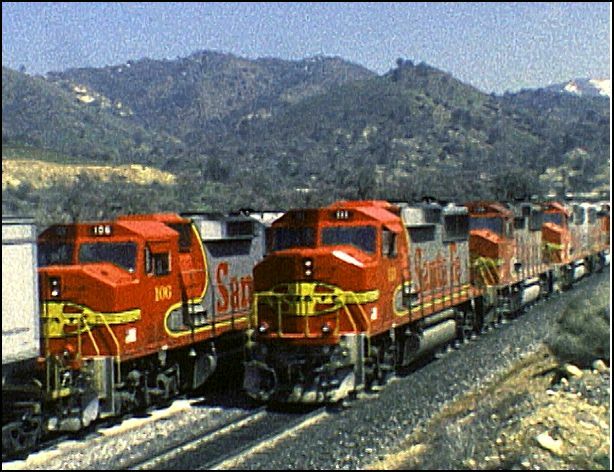 Southern Pacific and Santa Fe are the featured railroads. Charles often expands with a ‘above and beyond’ presentation style. While there are a variety of Tehachapi titles on the market, and some are well done. The uniqueness of a Charles Smiley offering is worth consideration- even if you have others. This new release could be definitive. Let’s review and see for ouselves. The shot that everyone wants to see. This train will reveal all Santa Fe GP30 locomotives in the lashup. This is where a train passes over itself, on the Tehachapi Loop. 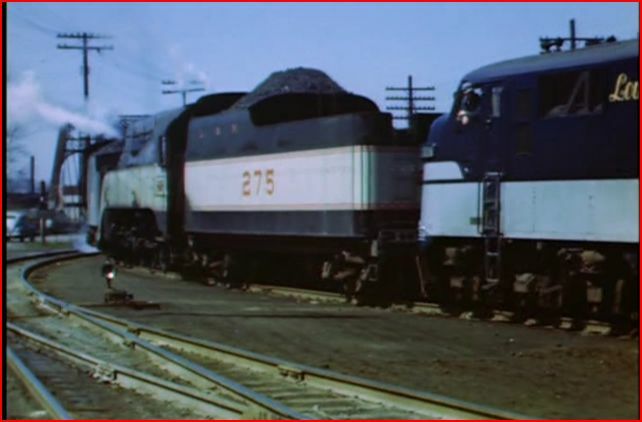 Notice the cleaner locomotives of the vintage SP. 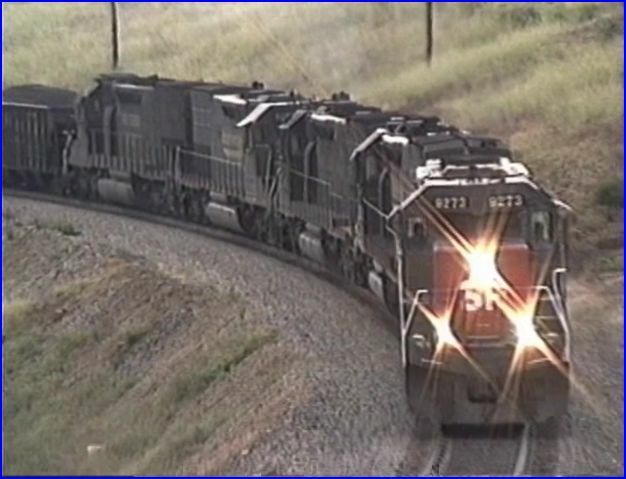 A Cotton Belt SD40T is on point. Passenger trains are included. 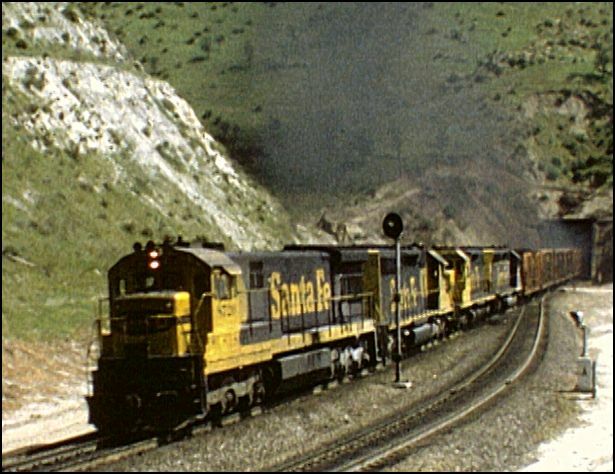 Mail trains on the Santa Fe. Ride an SP move. The Santa Fe F45 is captured in warm looking, California daylight. 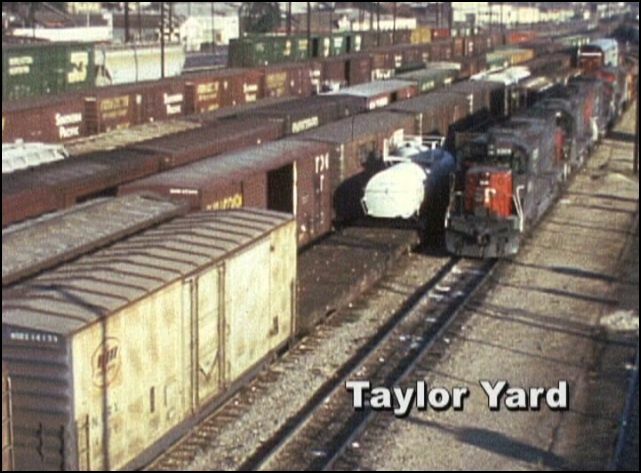 To use a single word for Taylor Yard circa 1978… crowded! Model railroaders will surely appreciate these scenes. 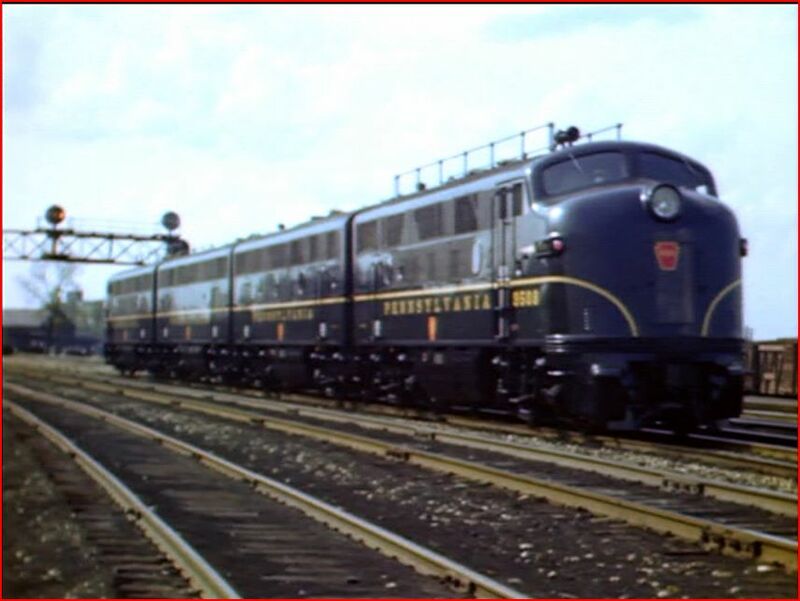 There are plenty of Santa Fe pinstripe scheme diesels. Judicious usage of his custom made maps can display, routes, elevations and trackage. Naturally, the expected location names are here. Additionally, Cajon Pass, Taylor Yard. and San Bernardino are a sample of what else is visited. Some of these are featured at length. Historical aspects are another cornerstone within CSP shows. 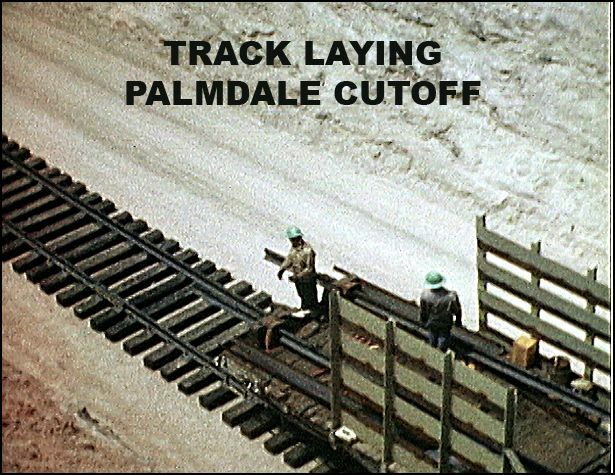 See the 1967 Palmdale Cutoff. A freewheeling narrative that is highly detailed. Charles performs the narrative. 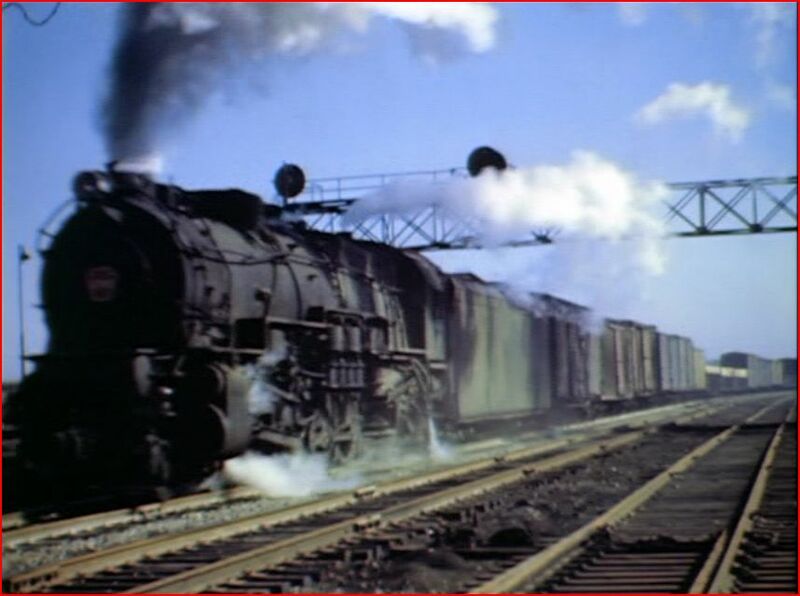 This is non scripted, and contains a master class on railroads. 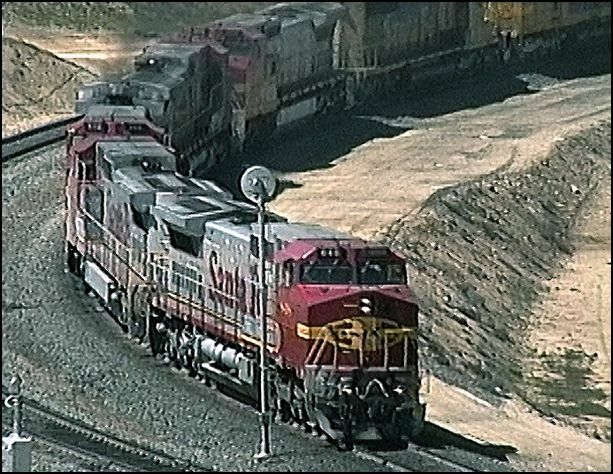 Soundtrack has a large supply of natural and builder accurate locomotive sounds. Various musical backgrounds are another part of the audio. The narration is balanced with some non narrated trainwatching. This program is a double feature. 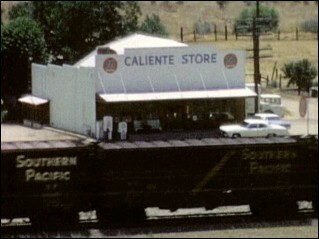 There is contemporary, 1990’s era Tehachapi. 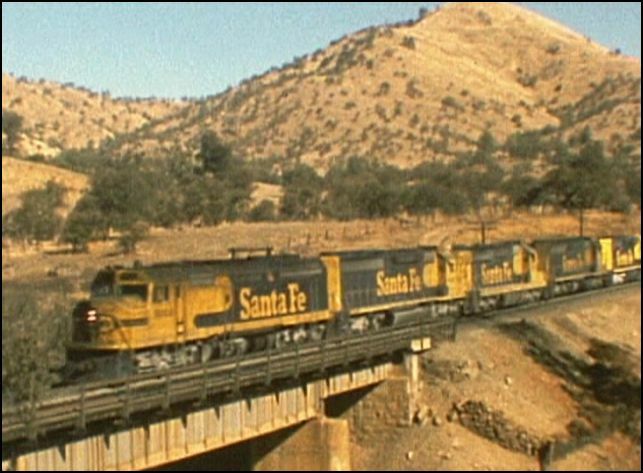 Vintage film has a great overview of Southern Pacific and Santa Fe operations in the 1960’s and 1970’s. Viewers will enjoy 90 minutes of digitally restored and enhanced vintage Kodak color film. This feature alone, is worth the price of admission. A wide assortment of locomotives and views. * This is frame by frame restoration. Charles has the goal of providing the best for viewers. Helpers are operating both mid-train and as pusher sets. 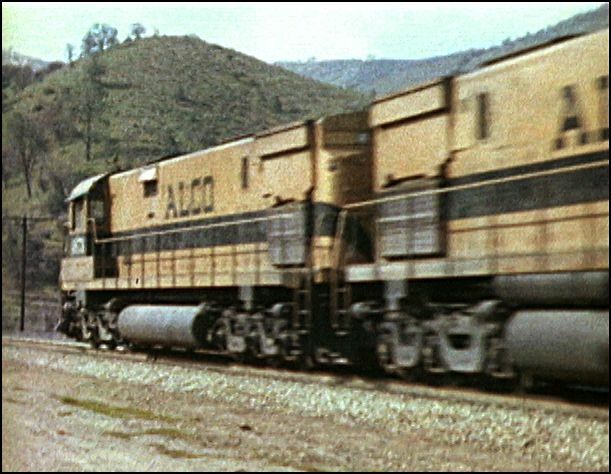 The Alco units were demonstrators. 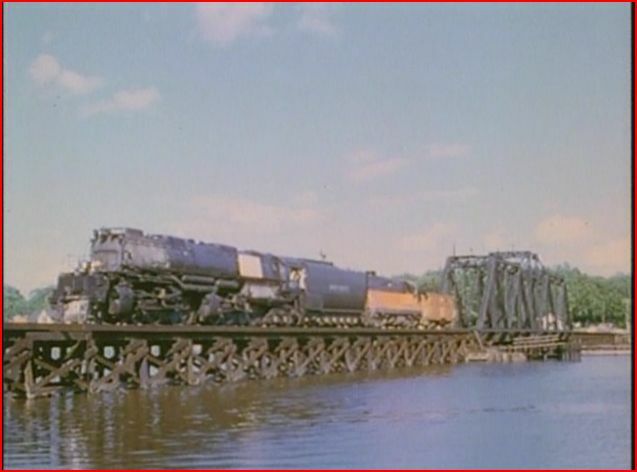 Learn about SP and why some locomotives were pulled from the mainlines. 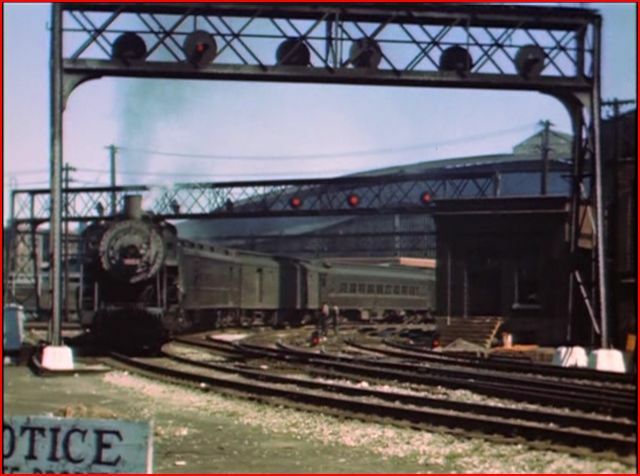 Some nice scenes that display the freight cars of the time. 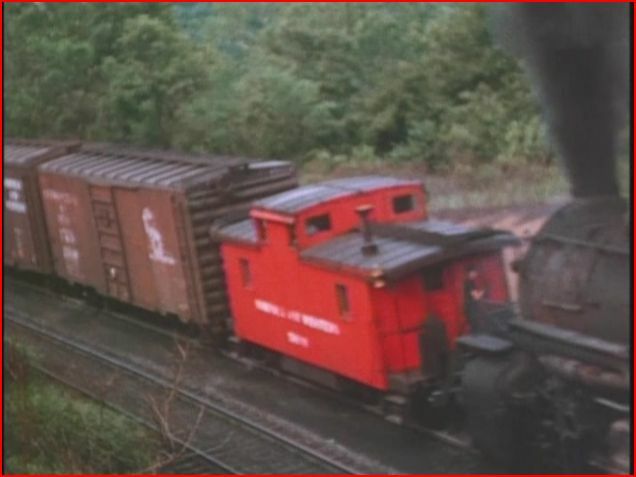 Interesting, to compare the shades of boxcar red on this train. 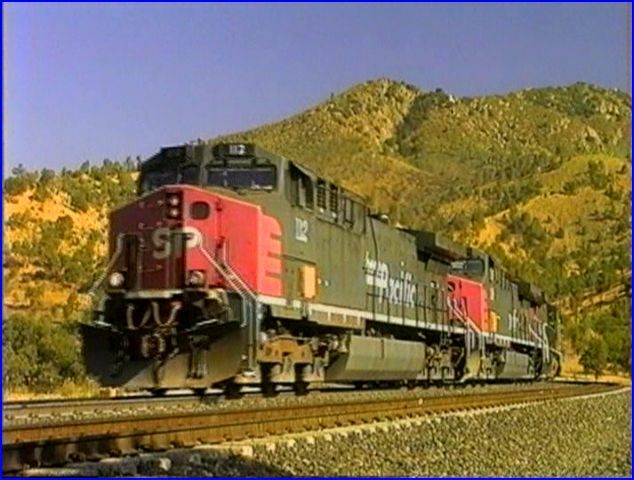 Santa Fe GE U36C locomotives and SP U33C class, are discussed. 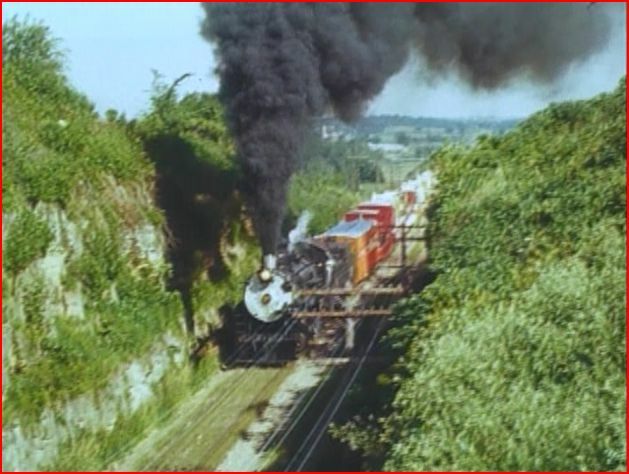 As this Southern Pacific freight exits a long tunnel, the sooty exhaust billows from the hole. 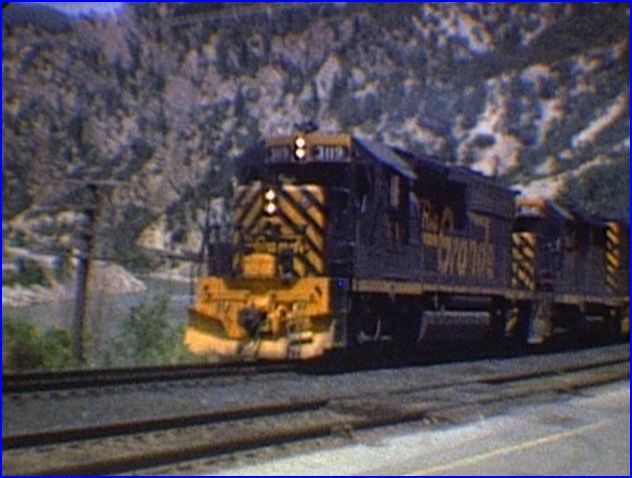 Oil Can train with an SD40T-2, in SP Kodachrome repaint, as a mid-train helper. After the vintage centerpiece, we are returned to the 1990’s. Both of these eras are enjoyable. We have just skimmed through a show that exceeds 2 1/2 hours. There is much more to see. Charles Smiley has the definitive Tehachapi program here. Combining vintage and modern, this high quality production is an immediate classic. 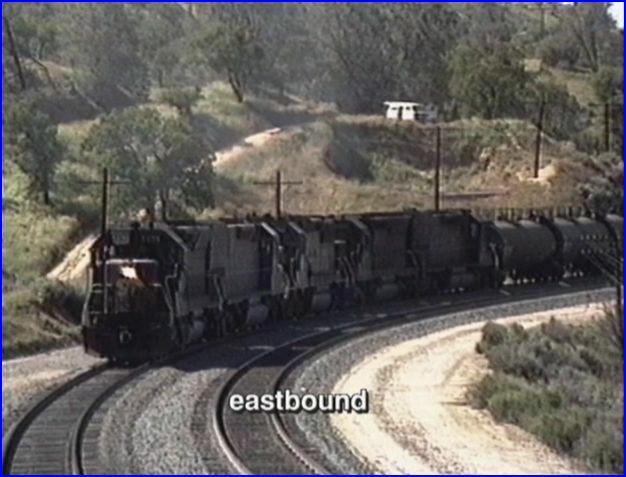 Railfans and model railroaders will find this new release a comprehensive overview of Tehachapi Loop, with surrounding areas. This great show is easily in the top of the Charles Smiley Presents catalog. Sources: Mark Johnson, Gino Pagliaro, Charles Smiley- video. Ten movie film sources. 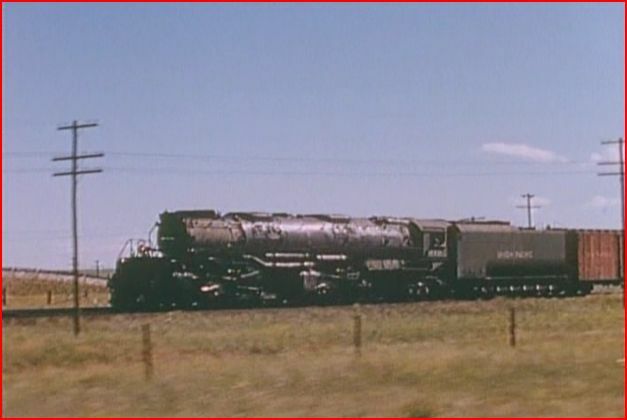 Union Pacific Expansion Years is the fitting subtitle for this show. Scrapbook shows feature assorted films from multiple years and locations. A focus on the growth of this railroad includes the fit of additions to UP goals and operations. 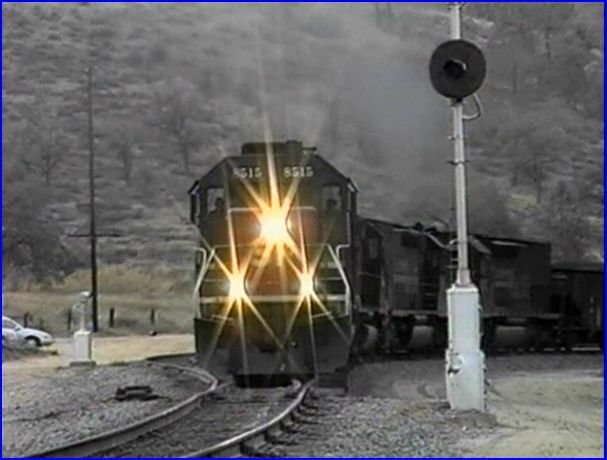 Providing action of vintage and modern railroading. Plus, plenty of good old fashioned trainwatching! 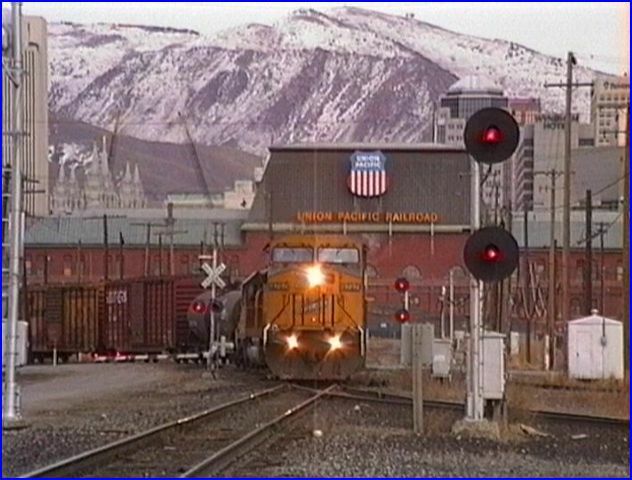 This release explores Union Pacific in this fashion. High quality is a hallmark of Charles Smiley productions. 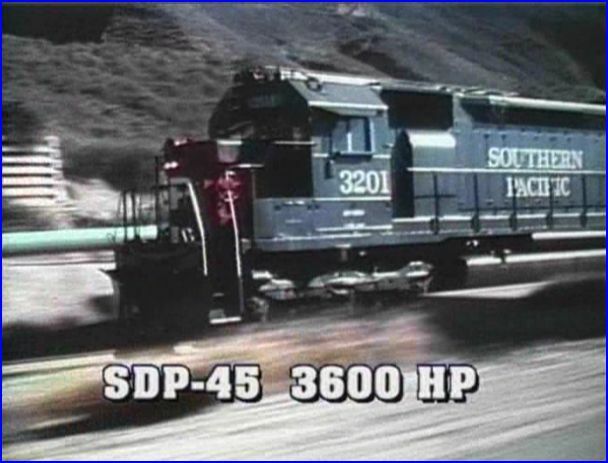 Notice how the diesel sounds are matched to the locomotive. Digital film processing gives fine picture standards. Featuring highly interesting and informative narration. Charles gives the audience a plethora of historical backgrounds. Passenger service is one of those discussions. Perfect scene for model railroaders to recreate in miniature. Charles is an accomplished model railroader as well. This authentic yard is at Portland, Oregon. 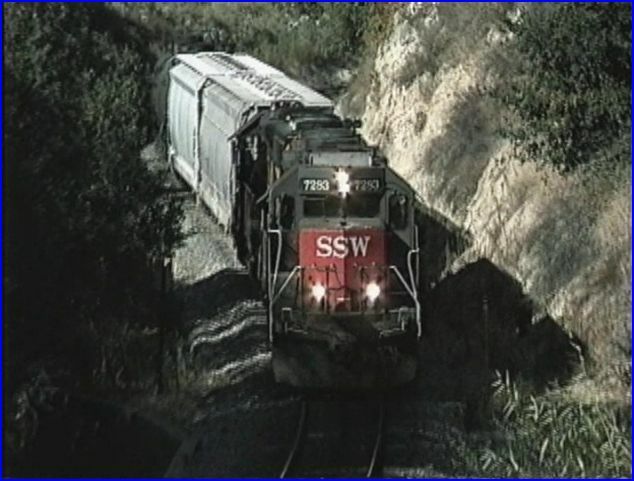 Check the ATVR links to visit Charles recreation of Southern Pacific in HO scale! Intriguing storyteller, the Rio Grande is one of the show within shows. Frequent and varied, multiple custom maps put the routes and locations in perspective. 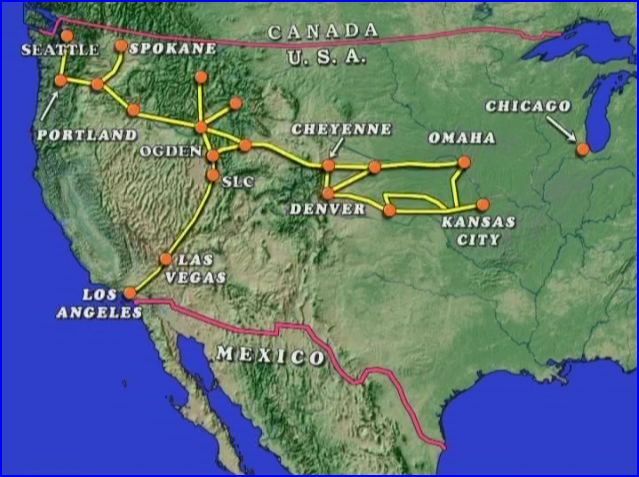 Thorough map coverage has system type maps for roads merged into UP, such as: Southern Pacific, Rio Grande, Missouri Pacific and Chicago Northwestern. Close up maps like Cajon Pass, are another welcome inclusion. Chicago was a key gateway, that had been long coveted for a direct connection. 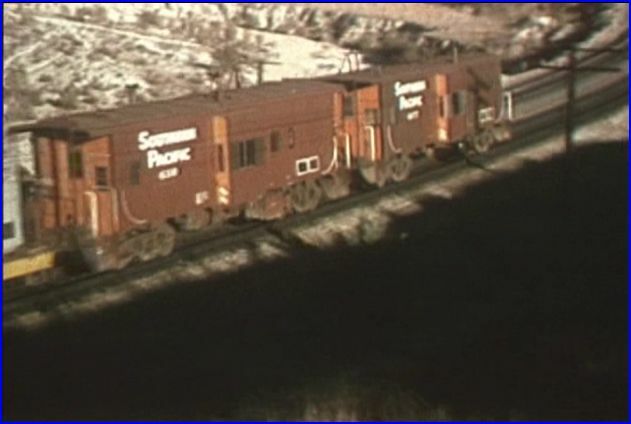 While joint CNW-UP power and cabooses could be seen for years in the area. It wasn’t until CNW was absorbed in 1995 … and that is explained in detail. Outside of Tucson, Arizona in the 1990’s. 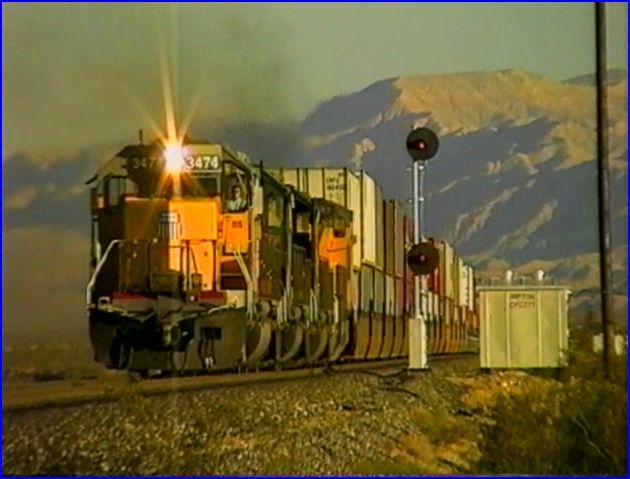 Sharp video from 1996 documents trains in the Tehacapi Loop vicinity. 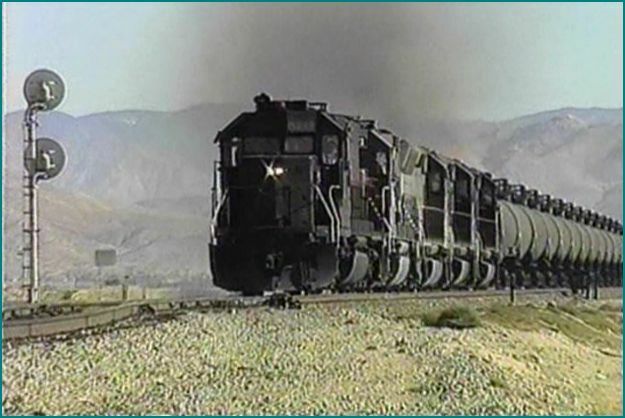 Classic shot at Tehachapi Loop. 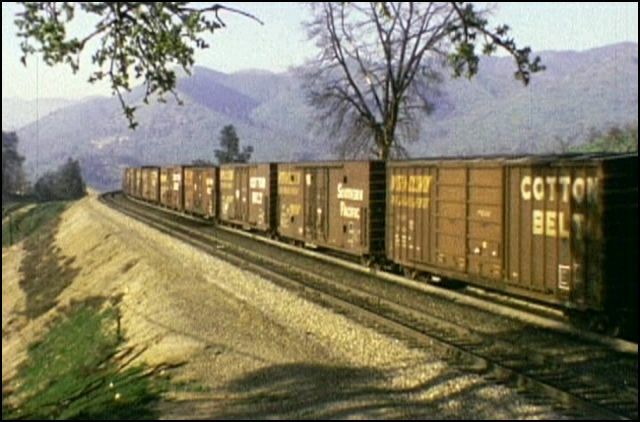 Unusual locations set this apart from many modern train videos of UP. Exhilarating cinematography, that is far ahead of crossing gate scenes of many others. 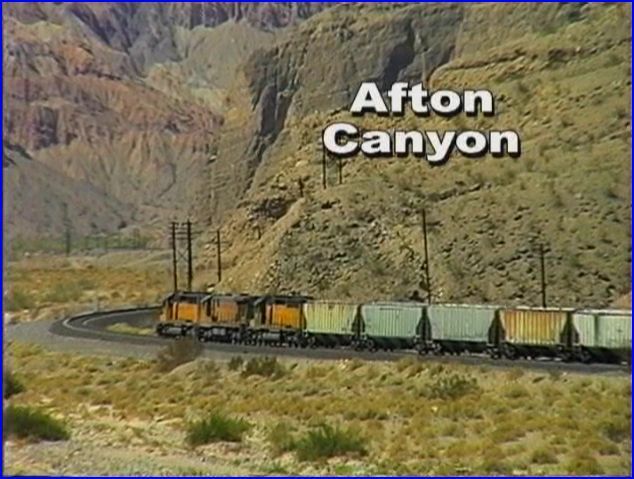 Afton Canyon is a must see. .That 1965 Ford Mustang is a match for the year of this street running local. 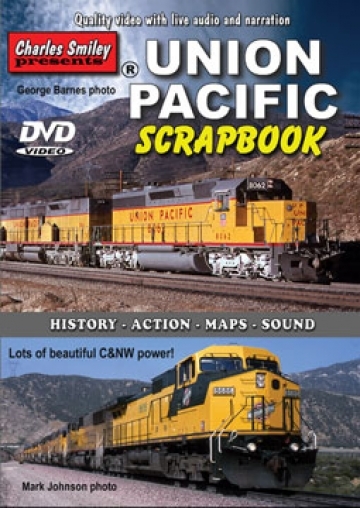 Union Pacific Scrapbook is an excellent show for railfans and model railroaders. The vintage portions are a smaller percentage in this release. Get Union Pacific Vintage West first, if you want many classic trains. 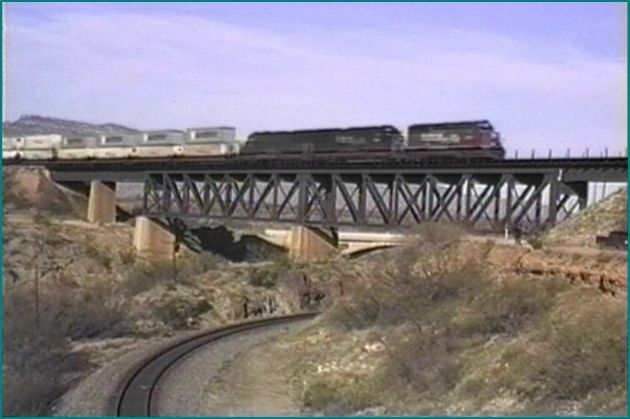 Consider this one as a look at Union Pacific in the mid 1990’s. That will be great for those who are seeking double stacks and third generation locomotives. The modern slant is not my particular preference. Any fan of this contemporary era of railroading, will be very happy with this program. Time Period: 1990’s + 1970’s. Locations: Coast Line, Lompoc, Tehachapi Loop, Santa Paula branch, Bakersfield and much more. Sources: Jeff Perry, Charles Smiley and others. 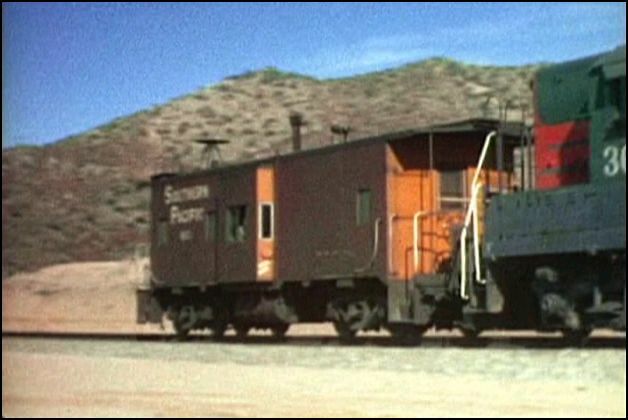 Charles Smiley maintains a vibrant enthusiasm for all things Southern Pacific. 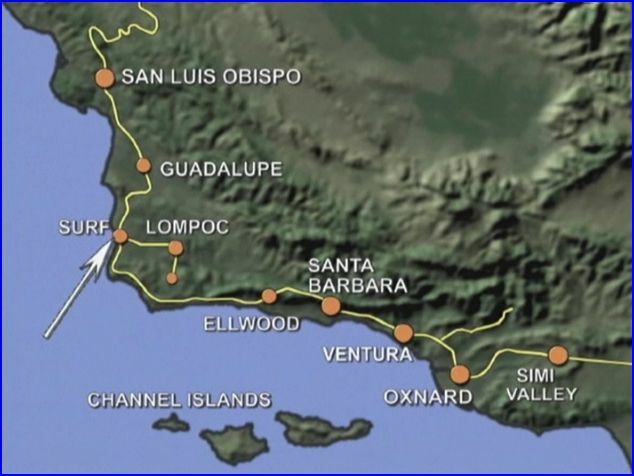 This program features much Coast Line action in California. Largely shot in the 1990’s. 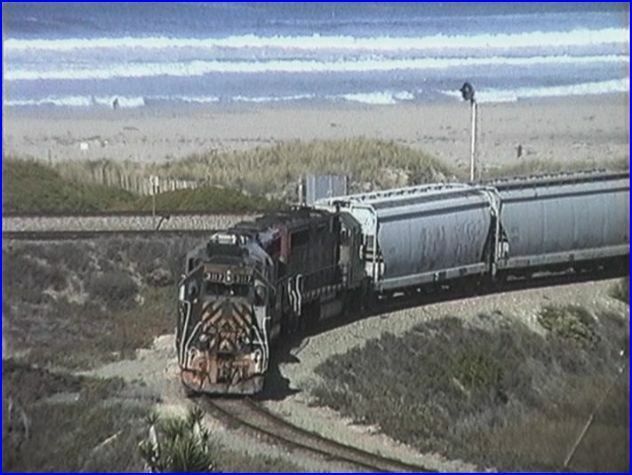 Plenty of action on area branchlines and we folow the Saugus Local. There are many extras included in all Charles Smiley Presents releases. True, factory made silver DVD’s. Custom made maps are numerous. Synced sound and first class audio editing. 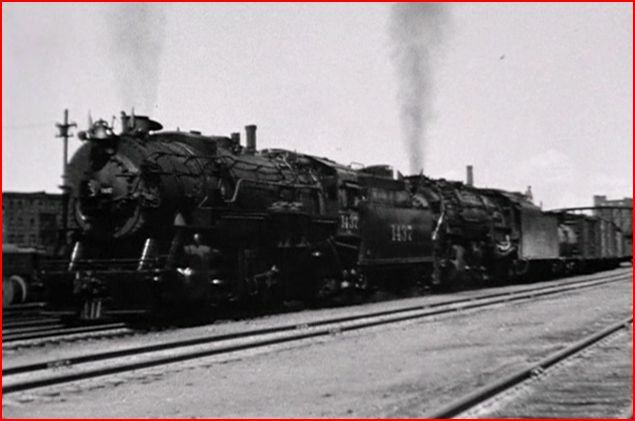 Masterclass level narratives that convey a treasure trove of information on railroads and history. 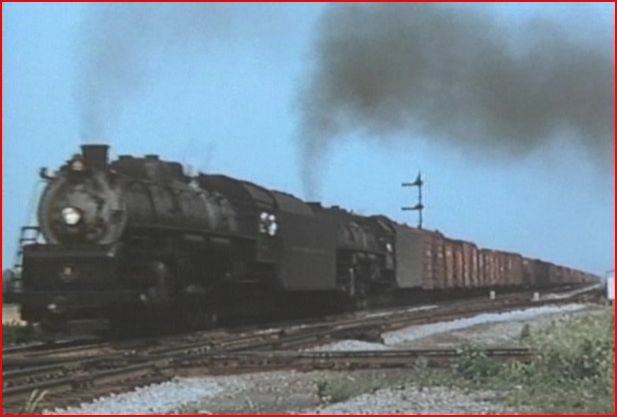 There are period photos, railroadania and appropriate music within those shows. Chapter menus and well organized programs. Many of his releases could be shown as PBS style features. The high quality is consistent. This one is more of a straight train video. Besides being a top level producer, Charles is also a model railroader. 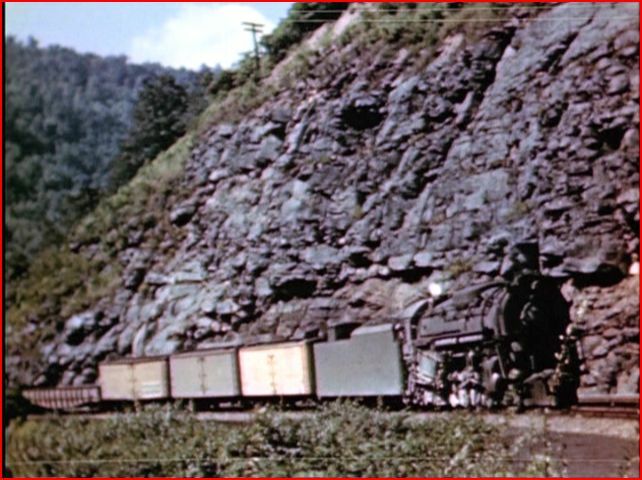 See the link to visit his railroad. This perspective, provides a unique insight from a modellers viewpoint. Inclusion of vintage trains and period operations can give inspiration to those recreating trains in miniature. Generally, there is so much happening with visuals and audio, these are busy shows! Multiple viewings are needed to absorb the operations, and vast amount of historical references. Scarlet and Gray Memories has a focus on contemporary era SP, albeit in the 1990’s. That time period is more interesting than present day trainwatching. Also, less interesting when compared to earlier eras. Using a wealth of excellent action based cinematography, this show is action packed. 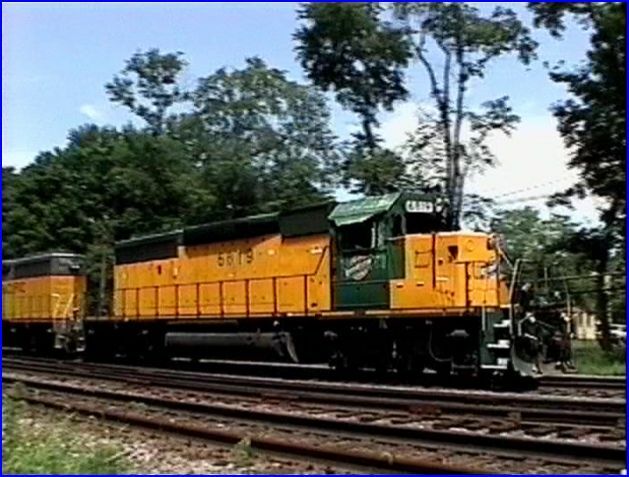 Second generation diesel power of mainly EMD units, are the main players. Interspersed are some newer locomotives. 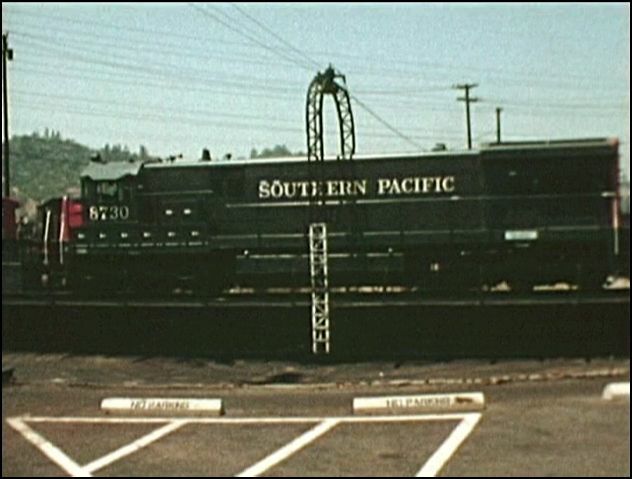 Southern Pacific in; classic, speed lettered and Kodachromes in SP and SF. 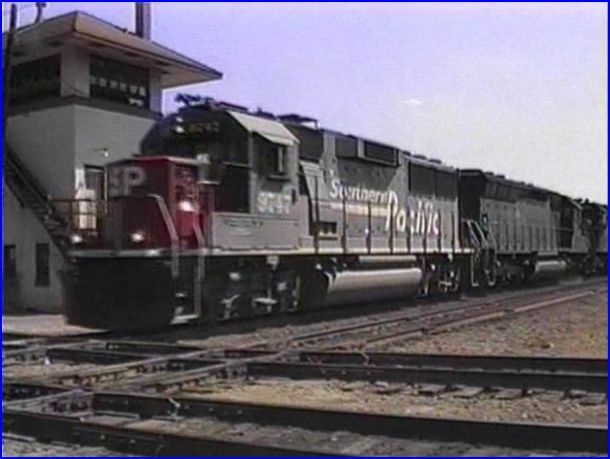 Other liveries include: Rio Grande, Santa Fe, Conrail and Union Pacific. Additional units from other lines too. 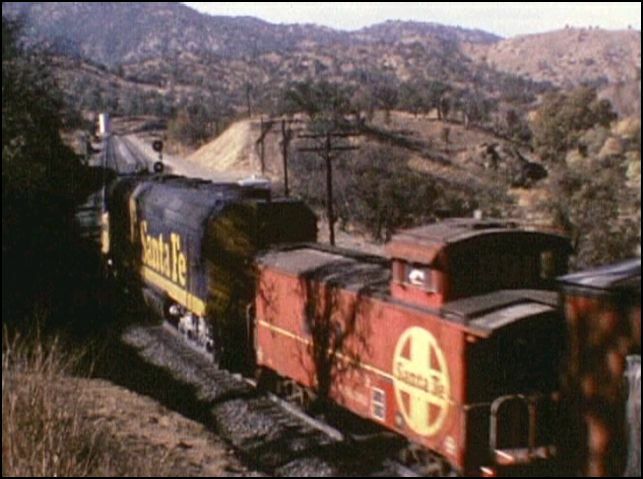 The 1971 footage around Tehachapi Loop vicinity, looks great and is fun to watch. 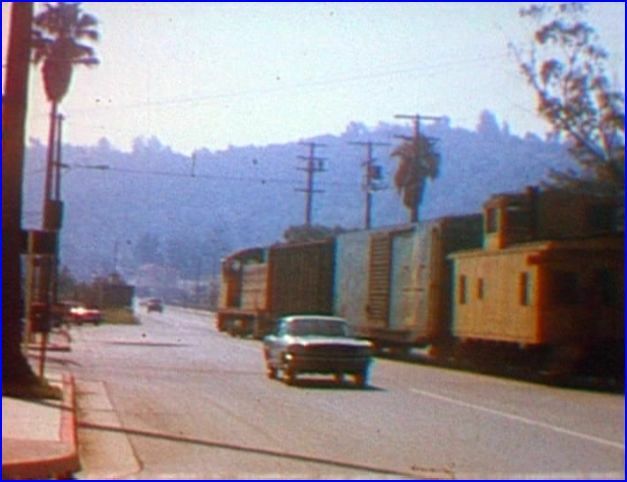 Vintage films have a greater presence on the second half of the show. Quality is excellent to good. Obviously, years and sources vary. Ride part of the Coast Line onboard an Amtrak passenger train. Milepost 318 at Surf. 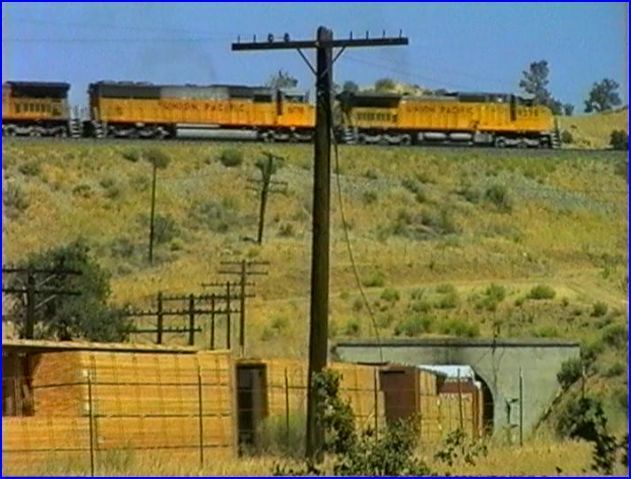 Memorable parade of freights around Tehachapi Loop area. Long head end lashups, plus mid-train helper sets. Tunnel motors abound. Time travel back to a cleaner SP circa 1971. Digitally restored film that is sure to please. This feature is a real treat!! 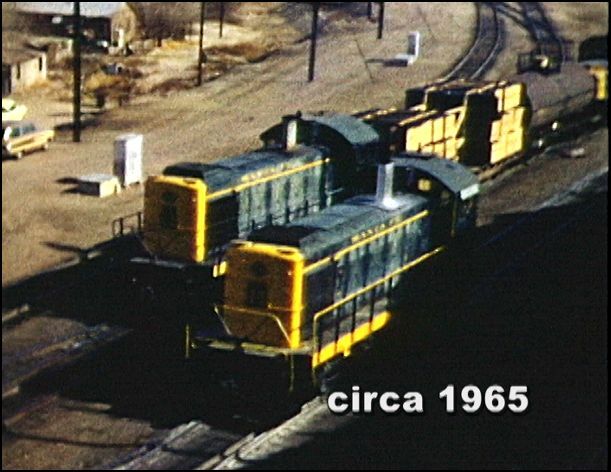 Bakersfield contains footage from 1993 and 1971. Yards action is highlighted here. 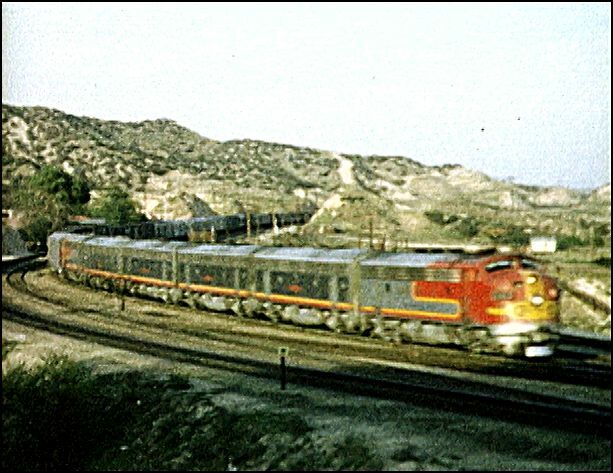 Alco S6, RS32 and GP9, SD9, F7 locomotives are seen. Extended vitage coverage continues at Tehachapi and various locations. 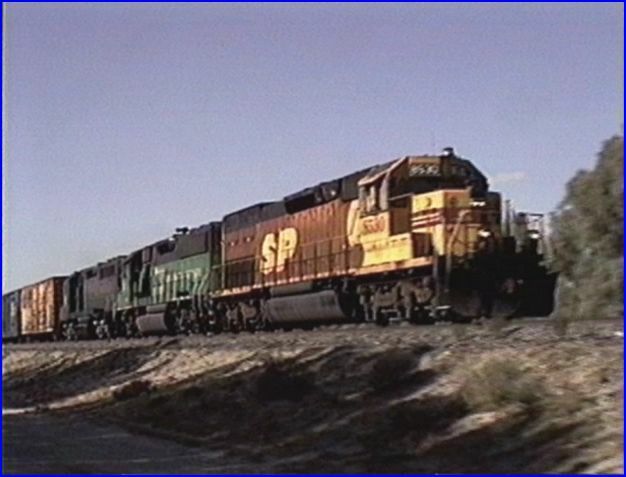 SPSF 1986 merger period is discussed and Santa Fe at Mohave. 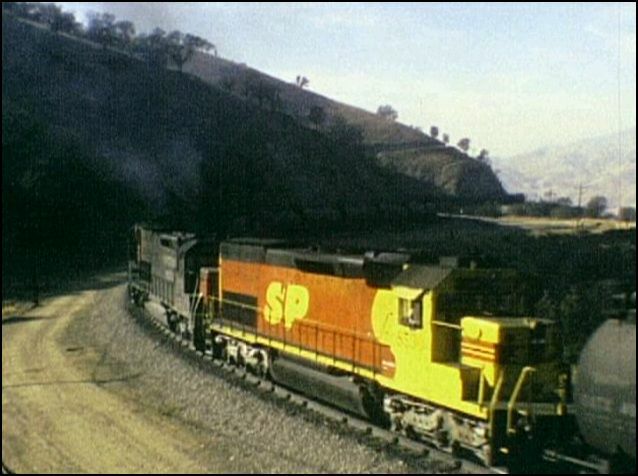 SP at Cajon Pass in 73. As with most CSP shows, there is some overlapping footage. Depending on your collection, you may or may not notice. Each program is a stand alone presentation. Any duplication adds to the individual subject. Overall, Scarlet and Gray Memories is a fine look at the targeted times and subjects. The comparisons to over a 20 year timespan are interesting to see. 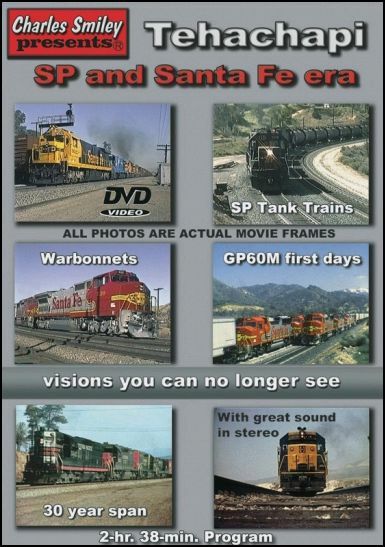 A must have for fans of Southern Pacific. Charles sets the bar high on his productions. Compared to his other SP releases, this one is just slightly under some of his others. Face it, the 1990’s just weren’t that special. In any case, it does surpass much of the competition. 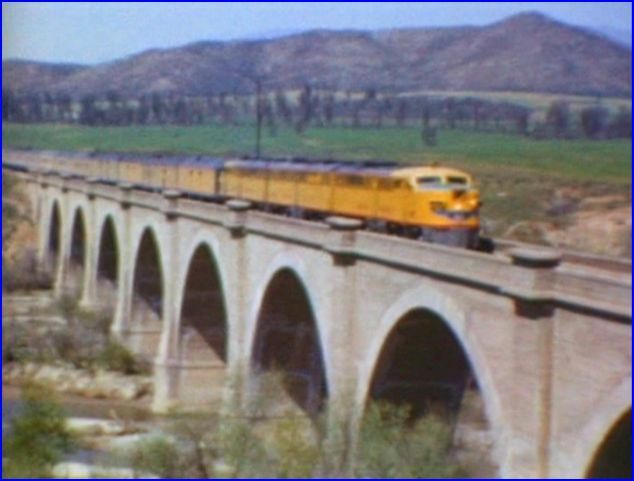 Locations: Tehachapi, Santa Cruz, Tucson, Benson, Stockton, Coast Line, Vesona Branch, Ione Branch, Surf and much more..
Charles Smiley showcases Southern Pacific Railroad. 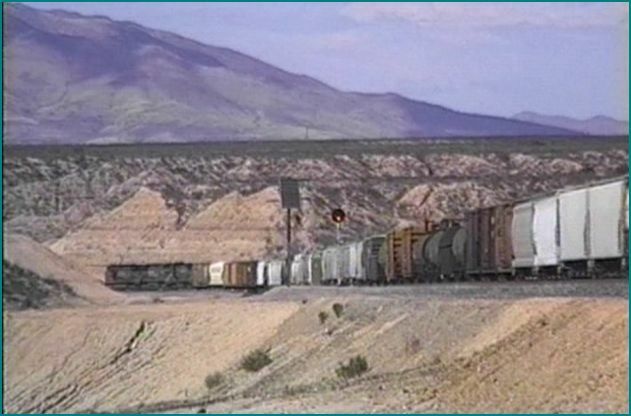 Arizona and California in the 1990’s, along with earlier 1985 footage. Scrapbook is a fitting title selection. Many locations are visited. 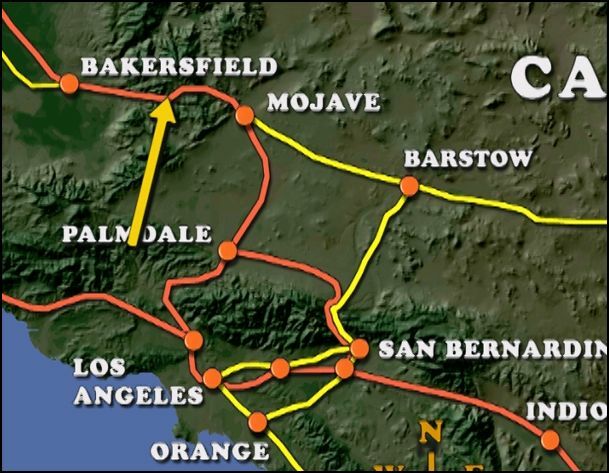 Famous ones such as Tehachapi Loop. 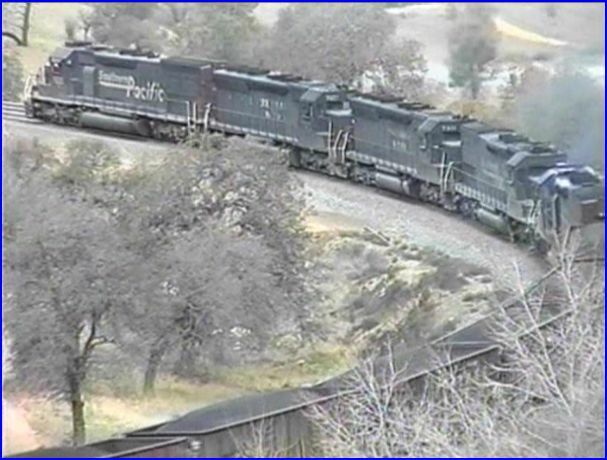 Branchlines that are not often seen in this timeframe, and southern Arizona action. An array of train types. 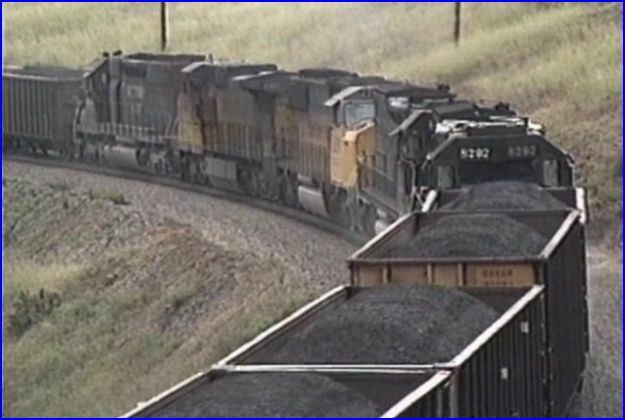 Sugar beets, oil cans, double stacks,manifests, coal, locals, and helpers. 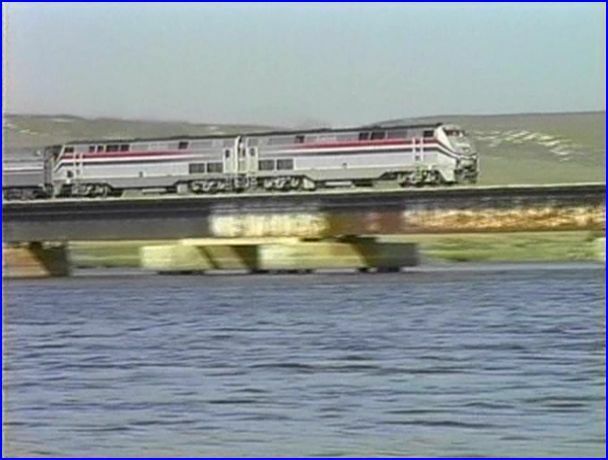 Passenger trains, SP and Amtrak. It is interesting to note, this is an older release from CSP. The benchmarks of his productions are here, albeit in sometimes an earlier incarnation. There are plenty of custom maps to sort out the locations. A simplified version compared to recent years visually, they are equally effective in function. Another notable inclusion. Charles Smiley has plenty of his own camerawork in this production. You can have fun and try to discern a number of his shots. Well composed, detailed and with a unique, often artistic viewpoint. This alone makes this show worth seeing. Hint: watch Donner Pass Thunder, as that Donner video was shot by Gino. You will notice the two styles from the cameramen. Both are excellent! 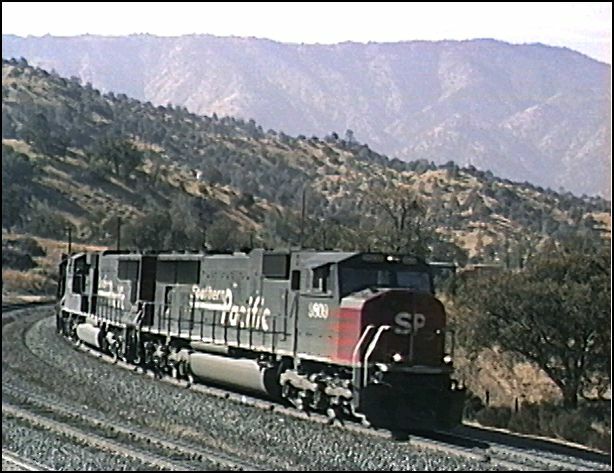 Tehachapi Loop is visited. 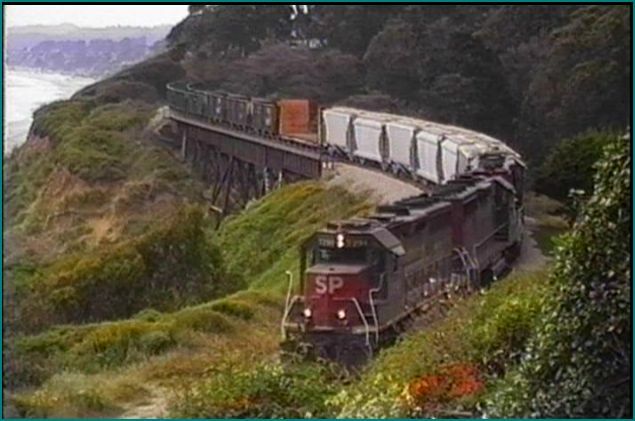 Southern pacific circa 1994. Another Charles Smiley standard. 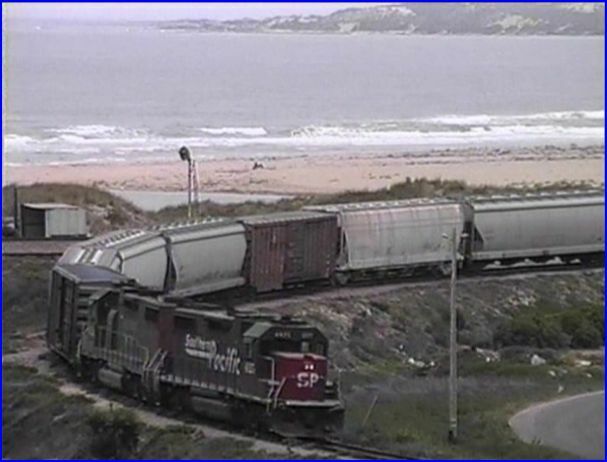 Multiple viewpoints that add to the railfan’s delight. California features a plethora of colorful scenes. Santa Cruz street running. Arizona landscape is a contrast to most of California. The Sonoran Desert is different than the Mohave. Fine looking and varied, graphics are interspersed through the show. The Lordsburg district is in Arizona. Vast deserts combine with mountain backdrops here. 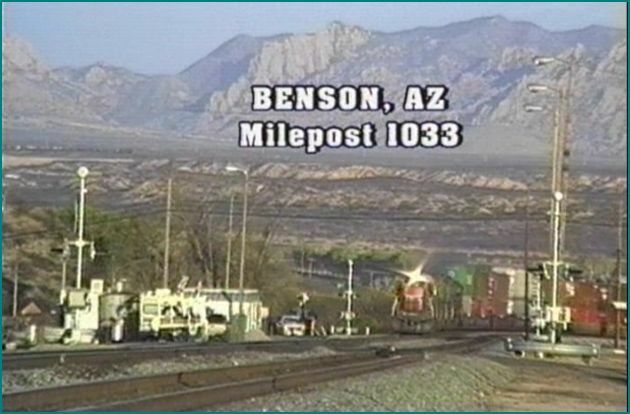 Tucson has some vintage locomotives. SP’s mainline is a busy one. 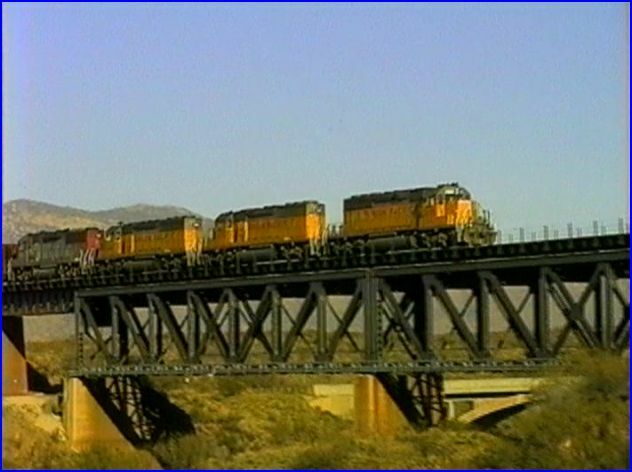 A remote bridge, in Arizona, provides some great trainwatching. Stockton Junction has a classic ATSF tower, with a nice long visit. 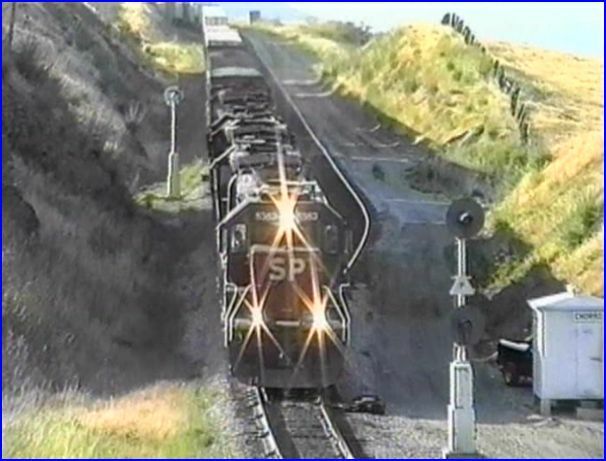 Besides SP, Union Pacific and Santa Fe have trackage here. 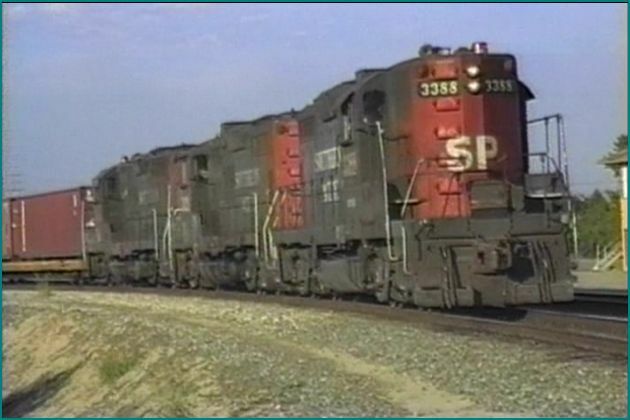 Check these three GP9’s on an intermodal move! 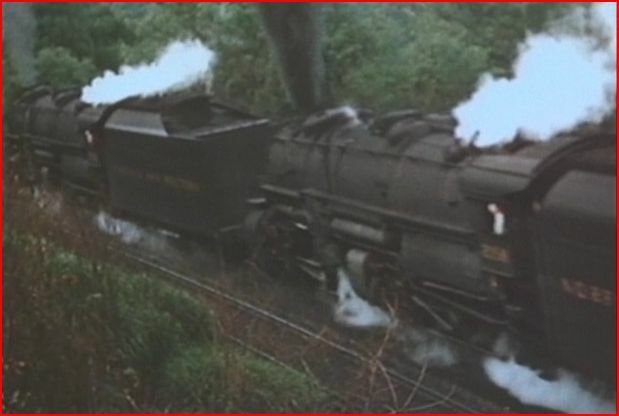 The older film, from 1985, fills out the story. 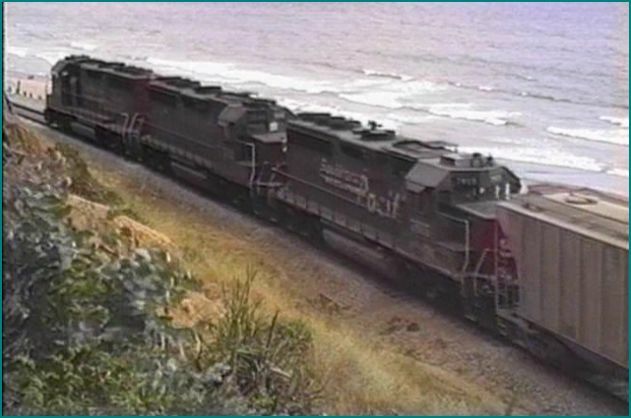 Here a Coast starlight is paced near Sea Cliff behind a pair of SDP-45 locomotives. Charles has conveyed the scarcity of rail traffic at some locations. This show was filmed over a period of years. It is an intriguing assortment, of trains and locales. Territory from the Pacific Ocean to the Mohave Desert gives viewers a variety of landscapes. 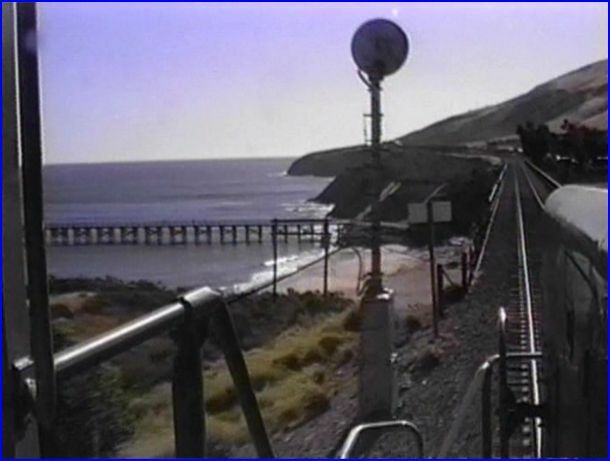 Lompoc Branch that begins at Surf. 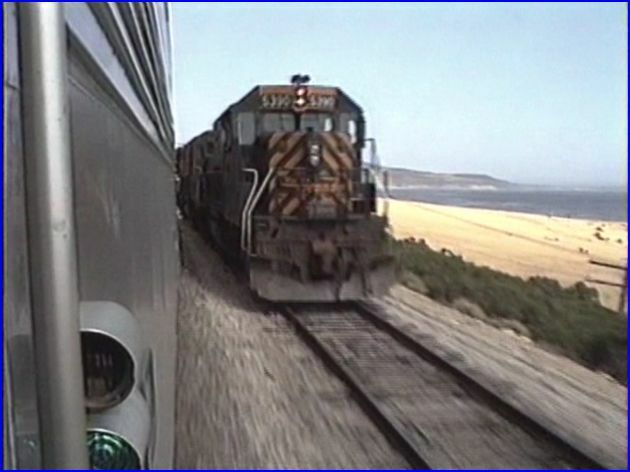 A little cab ride footage from one of the best seats on a US railroad! Southern Pacific Scrapbook contains the vision of any Charles Smiley Presents. A wealth of fine cinematography and great audio, that creates one highlight after another. History, contemporary action and inside stories, that give viewers an entertaining, and informative program. Time Period: 1940’s- 1960’s. Bonus 1990’s. The set is housed in a sturdy, hard plastic case. Each disc is mounted on a hard plastic page. Seems very durable. Green Frog has a tantalizing boxset. This contains 7 discs and 7 complete shows. All of the programs have individual, full reviews on ATVR. A brief overview of each will follow. All of the shows are digitally edited on state of the art equipment. Each disc has artwork. Maximum fun calls for many different screenshots from the full reviews. Bonus for you! 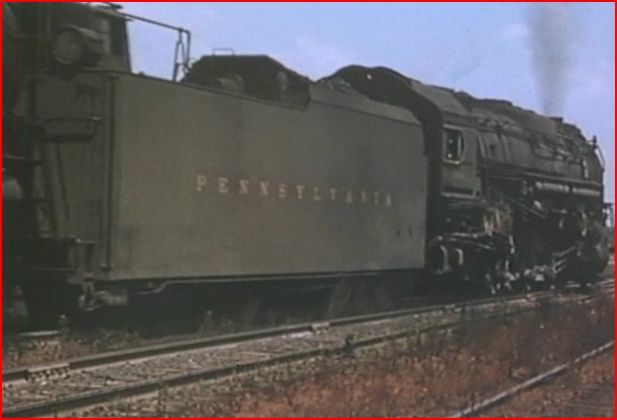 The Golden Twilight of Postwar Steam Part 1: The Pennsy’s West End and it’s neighbors. 1947- 1950. Gene Miller 16mm. Early diesels. 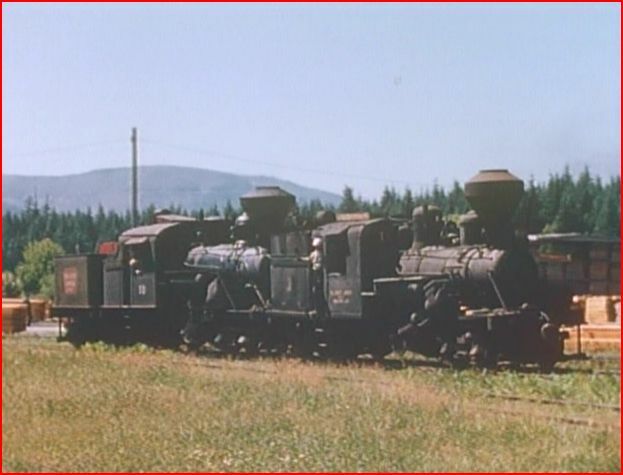 A quartet of ‘chicken wire’, Electromotive F3 locomotives. 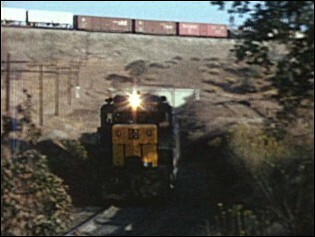 L&N Mountain class at Howell Yard. Evansville, Indiana. Steam and diesel are both here. 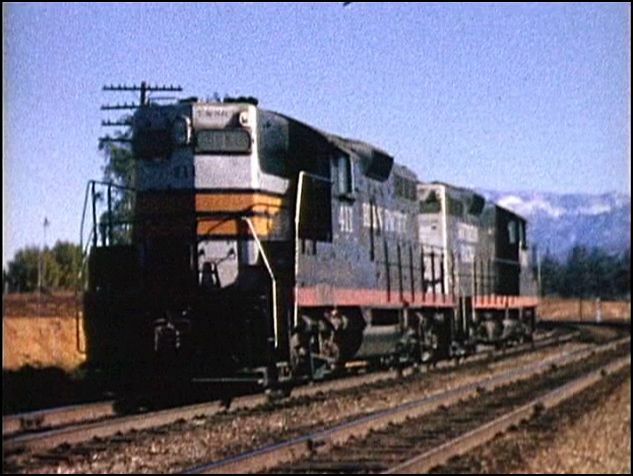 A K-5 Pacific with an EMD E7 unit. 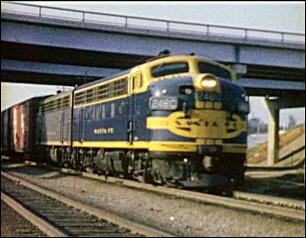 Chicago & Eastern Illinois departs the massive St. Louis Union Station. C&EI has these pretty F3 engines. Nice variety on this railroad. 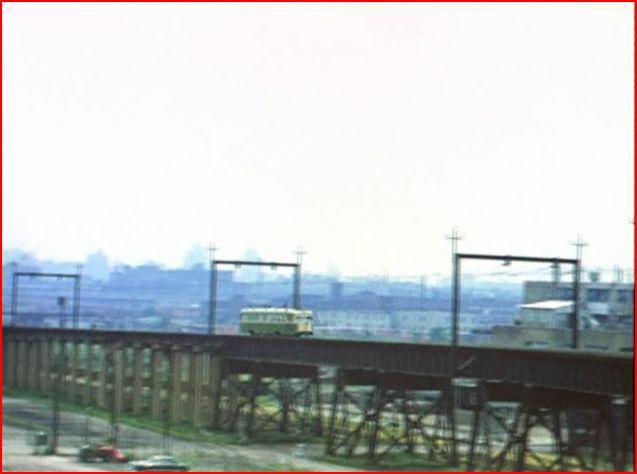 Illinois Terminal once had a sizeable trolley operation. Strange entry for a steam series. 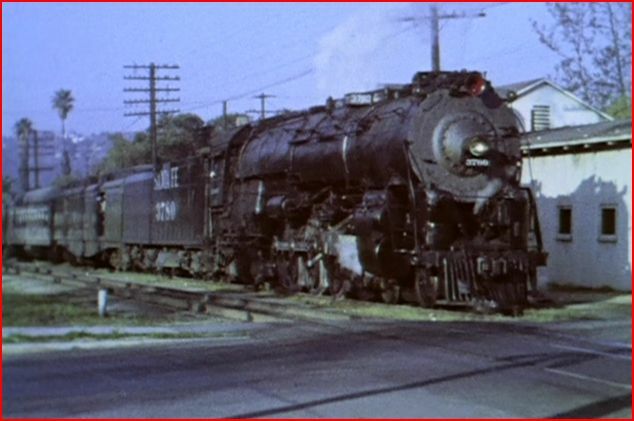 The Golden Twilight of Postwar Steam Part 3: Cajon to Horseshoe- Trains Across Mid-America and the West. Gene Miller. 16mm. 1940’s- 1950’s. Many railroads are seen. Color, plus black and white film. 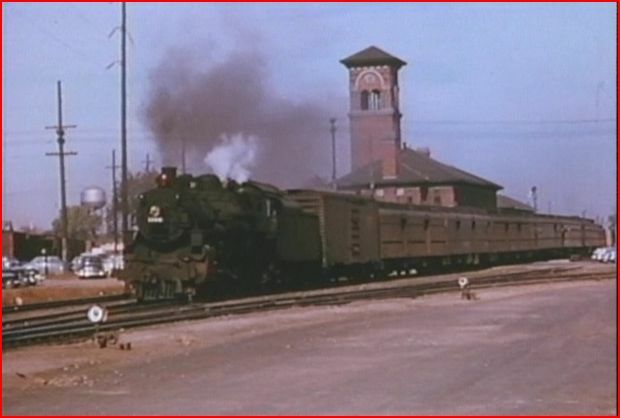 Santa Fe steam shown from California, to Dearborn Station, in Chicago. Union Pacific has an awesome collection. Cheyenne and Denver. 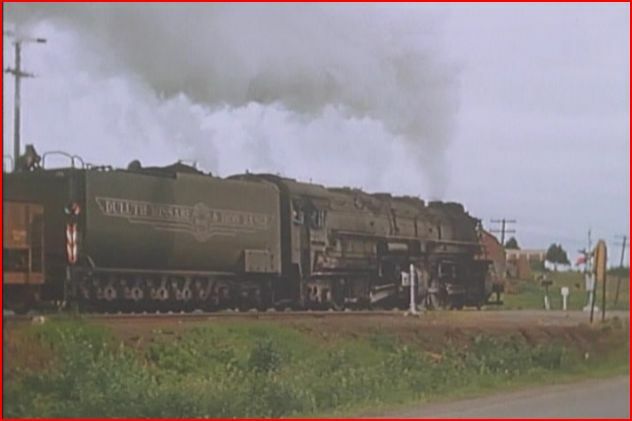 Big Boys, Challengers, Northerns, switchers and those big 9000 class locomotives. Plus more! St. Louis Kaliedescope has various lines. 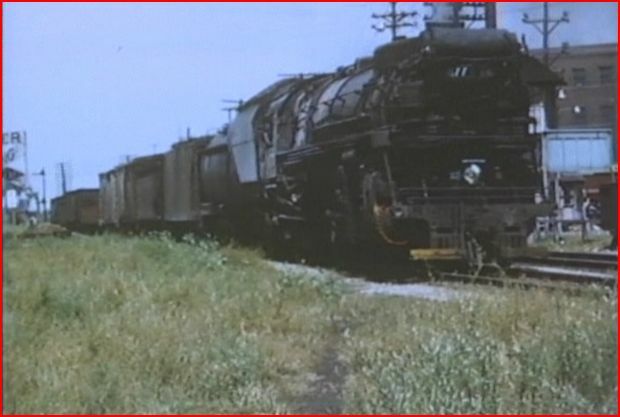 MoPac Heavy Mike 1417 shown. Some fine black and white, plus color in this show. 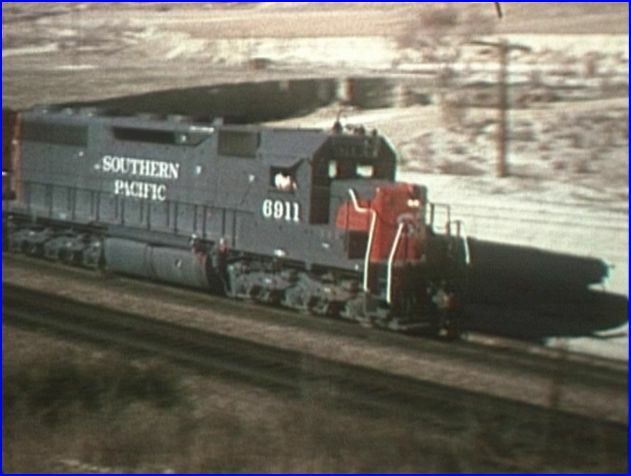 Missouri Pacific has color also. Nice chapter. 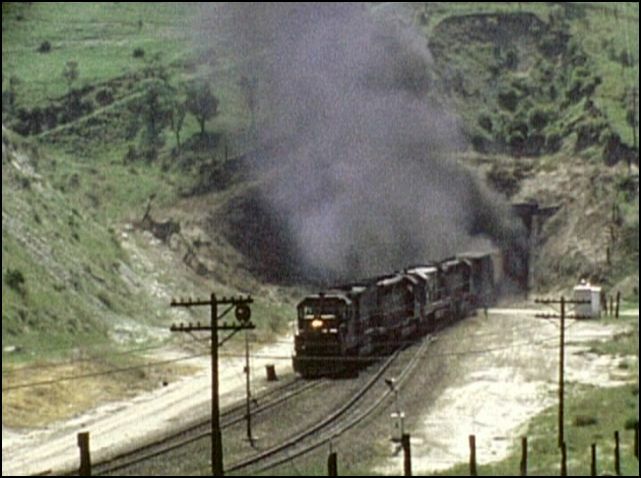 Horseshoe Curve finishes up the Gene Miller films. Jerry Carson. 16mm. Covers 14 different railroads. 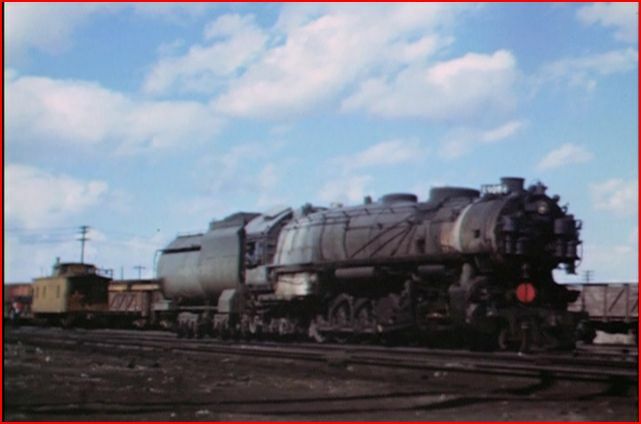 B&O with a pair of big T-1 class locomotives at Chicago. Plenty of classic B&O within. 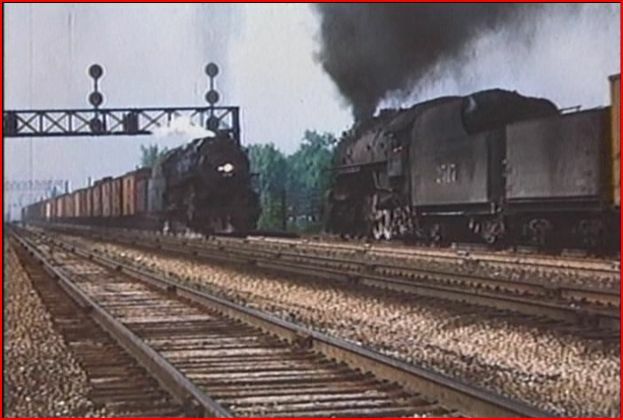 Some great action on the Norfolk & Western. 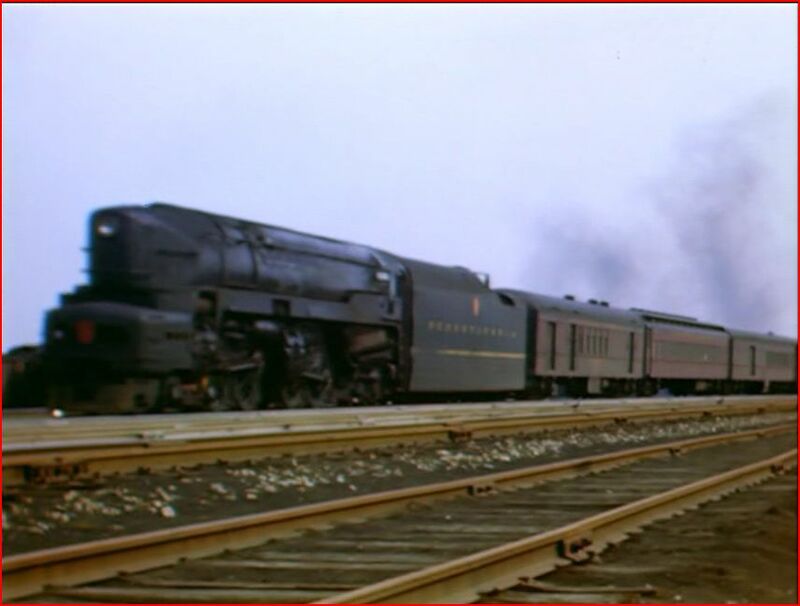 Chicago & North Western departs Green Bay. 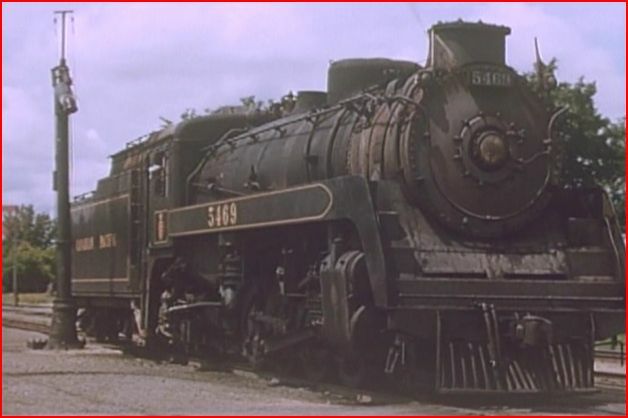 Chesapeake & Ohio is a tough road to find, in the steam era. Like some others in this show, there are only a couple of trains. 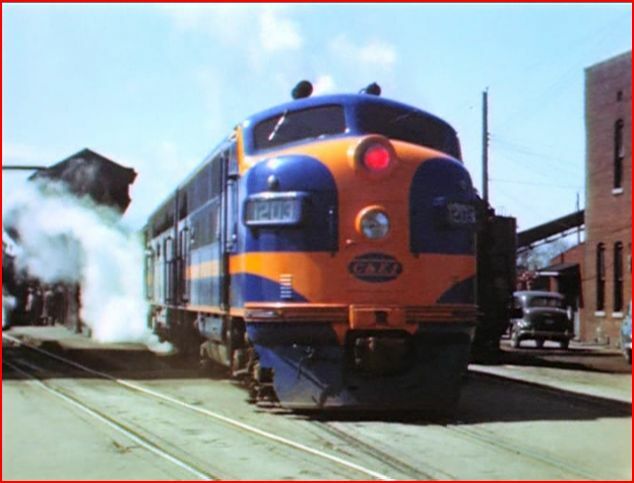 Illinois Central Railroad. This one gets extended coverage. Assorted locations and trains. Pennsylvania receives plenty of coverage. Doubleheaders too! Tom Strid. 16mm, mostly color. Shortest length show in the set. All classic. 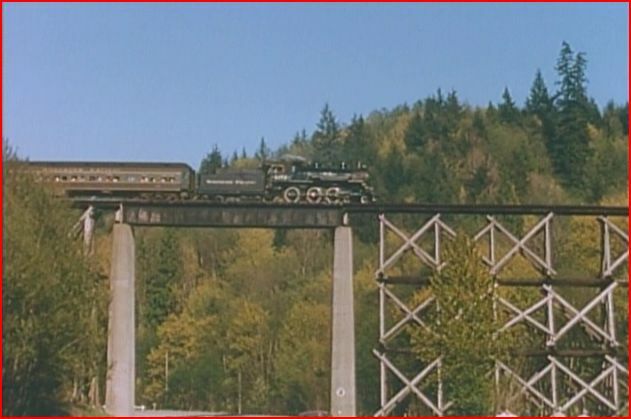 Union Pacific Big Boy is eased across the wooden trestle. 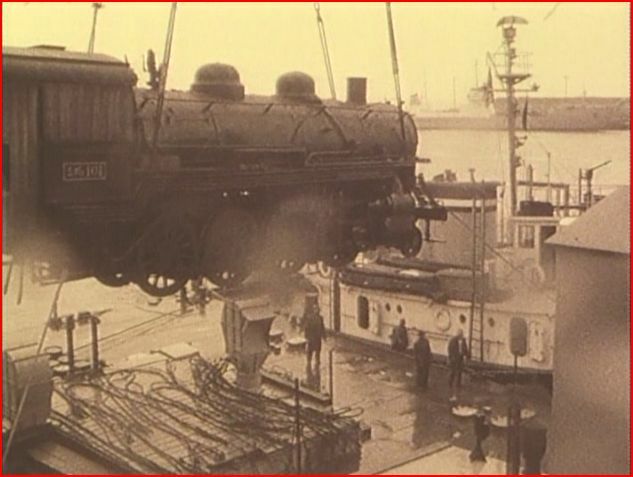 See this locomotive being returned to America, at the dock. The General Pershing. Circus World Baraboo train move to Milwaukee. 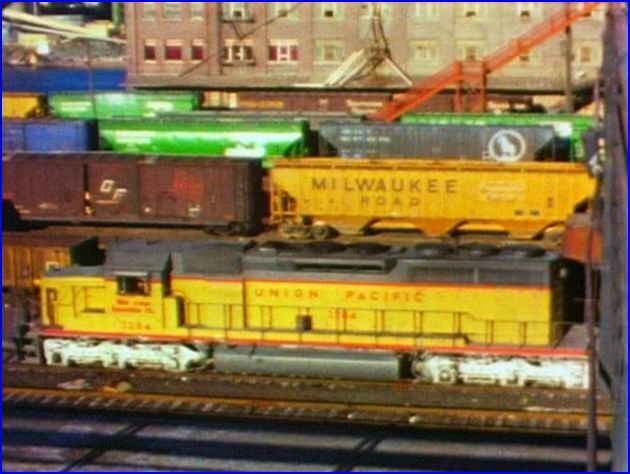 Some unloading is shown at Milwaukee. Ted Carlson and Maynard Laing. 16mm. USA and Canada. 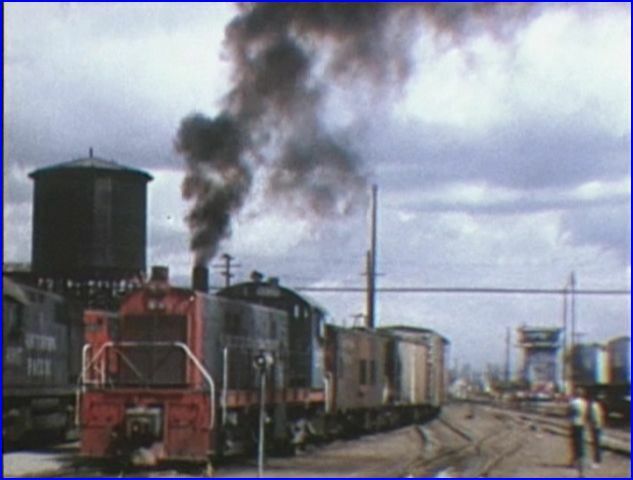 Hillcrest Lumber with Climax locomotives. UP Big Boy pace sequence. More Big Boy action is seen. Duluth, Missabe & Iron Range Yellowstone steam. Compilation steam program. Some repeat footage from these other shows, in this set. Still, it is a fun standalone program, and not everything is from this collection. 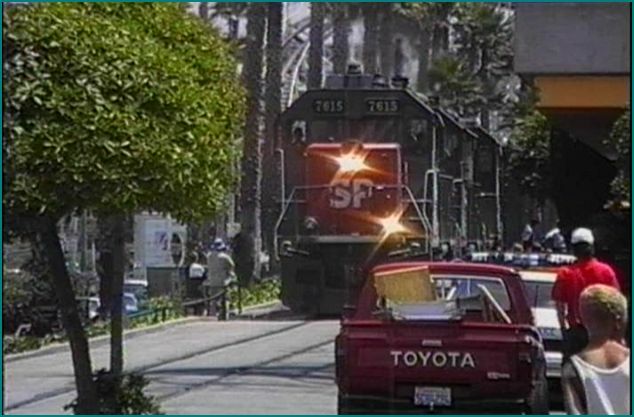 Some circa 1991 bonus footage includes: UP 844 and UP 3985. 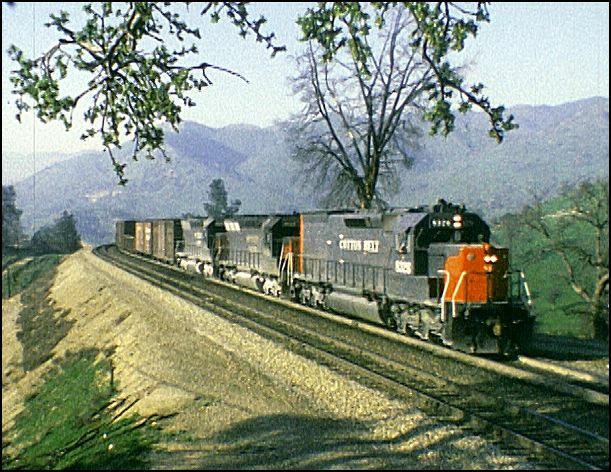 Norfolk & Western with vintage and contemporary era footage. Green Frog has a big winner. This 7 DVD set is an awesome value. This ‘package deal’, is a fast way to build an instant steam collection. A big bargain, that outweighs any issues. Highly Recommended for anyone with an interest in steam. The early diesels are equally fine. This Steam Special 7 PAK would make a memorable gift.